During our training, preparation and placements, many of us are filled with a natural human anxiety, worrying about the first time we stand before a congregation to celebrate or preside at the Eucharist or the Holy Communion. So much so, that we may be in danger of forgetting that we too are present among the congregation, to be enriched and fed spiritually as we meet Christ, present in word and sacrament. The Eucharist is the great thanksgiving – eucharistia (εὐχαριστία) – for the great goodness of God. Whether we call this “The Eucharist,” “The Holy Communion,” “The Sacrament,” or “The Lord’s Supper,” this is the central act of Christian worship where Christ encounters and feeds his faithful ones. So let us watch for these six moments as we are gathered together this morning. The candles are lit, and the altar or table has been prepared for our celebration of the Eucharist or Holy Communion. It is covered with a fair linen cloth. On this, in the centre we have placed the corporal, a square white cloth. On this stand the chalices and the paten, covered by a burse and veil in the appropriate liturgical colour. The Greek work ἐκκλησία ekklesía, which we translate as “Church,” refers to the gathering of the people, the calling out of the world and into the assembly. Before the arrival of the priest, the congregation gathers. We are here first and foremost as the gathered or assembled church, believers. Others may be guests, and welcomed guests, but it is not a secular gathering, on the one hand; nor, on the other hand, is it a meeting for evangelism. The presumption first and foremost is that those present are baptised believers. Already, the candles are lit and the lectern has been dressed in the liturgical colours of the season: which is green in Ordinary Time, including the time between the end of the Christmas Season at the Feast of the Presentation or Candlemas (2 February), and the beginning of Lent on Ash Wednesday. The memory of the silent prayers said by the priest before presiding or celebrating is retained in Holy Communion 1 in The Book of Common Prayer, where it says “The priest stands at the Lord’s Table. The people kneel.” And then the priest prays the Lord’s Prayer (without the doxology) alone. In common language, we normally use the words “celebration,” “celebrating” and “celebrant” for the person presiding at the Eucharist or the Holy Communion. 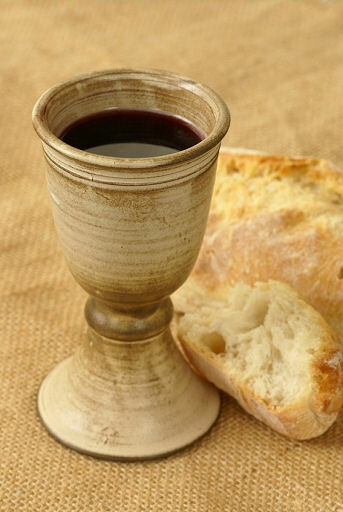 And we know why we are celebrating this Eucharist together this morning: This is Sunday, and, as The Book of Common Prayer reminds us (p. 18): “All Sundays celebrate the paschal mystery of the death and resurrection of Christ … On these days it is fitting that the Holy Communion be celebrated in every cathedral and … church …”. Come, Holy Ghost, our souls inspire. The canticle Gloria in Excelsis may be omitted in Advent and Lent and on weekdays which are not holy days. In Holy Communion 1, the canticle Gloria comes after receiving Communion. Its present place restores the canticle to its place in 1549. We have been forgiven, now – like the angels and shepherds – we can give Glory to God who comes among us. Peace to all your people through the earth be given! singing Alleluia to our heavenly King. Jesus Christ is risen, God the Father’s Son! With the Holy Spirit, you are Lord alone! show us now your mercy, now receive our prayer. in the Father's glory, all the praise be yours! Colin Buchanan has summarised the Eucharist as “A Bible study, followed by a prayer meeting, followed by a meal.” And so, Proclaiming and Receiving the Word is not preliminary to, or preparation for the Eucharist. It is both proclaiming and receiving. It is an essential part, an indispensable element of every celebration. 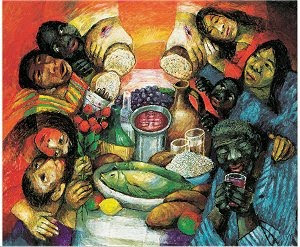 The Revised Common Lectionary provisions for the Second Sunday before Lent emphasise the theme of Creation: Proverbs 8: 1, 22-31; Psalm 104: 26-37; Colossians 1: 15-20, and John 1: 1-14.
while I rejoice in the Lord. The doxology, ‘Glory to the Father ...’ may be omitted, for the Psalms are valid Biblical prayers without having to be ‘Christianised,’ and on Sundays we have given our glory to God in singing Gloria. It is traditional to omit to doxology at the end of the Psalms during Lent and Advent. We often sing a canticle, psalm, hymn, anthem or acclamation as a gradual before proclaiming and receiving the Gospel. And that leaves us standing to receive the Word of God, facing the Gospel, which is best proclaimed and received, not from the table or the altar but among the people. Hear the Gospel of our Saviour Christ, according to Saint John, chapter 1, beginning at verse 1. And the Liturgy of the Word then naturally reaches its climax when we share in the common confession of the faith of the universal Church, the Nicene Creed. We may use other creeds in other forms of worship, but The Book of Common Prayer insists on the Nicene Creed in the Eucharist, and on Sundays and Principal Holy Days. And those who preside should show they are taking this bread and wine – and this is not about elevation. Only the bishop or priest then may say: “Christ our Passover …” This is one of the roles of the president, and cannot be delegated. There are three Great Thanksgiving Prayers in The Book of Common Prayer. We are using Prayer 3 this morning because it looks back to the past, looks to the present, and looks to the future, because it is remembrance and anticipation of the beginning and the fulfilment of Creation, because there is a true epiclesis or calling down of the Holy Spirit on us and on our gifts – because it is fully Trinitarian, and because its responses and refrains reminds us that Liturgy is the Work of the People, that we are all celebrating together. The spirit of each of these three prayers is thanksgiving. It is not supposed to be quiet, or penitential, or singular. The appropriate posture is that we are all standing, for all are celebrating. But how many people when they are leading the liturgy change this by asking people to kneel, or by asking them to kneel for the Sanctus. The only rubric for posture in Holy Communion is Stand, and, as Bishop Harold Miller says, the normal place for presiding is behind the altar/table, with hands out-stretched throughout the prayer. The body of Christ given for you. Our ‘Amen’ is our Amen to Christ present to us and among us in so many ways this morning … in Word, in Sacrament, and in us collectively as the Body of Christ. (Revd Canon Professor) Patrick Comerford is Lecturer in Anglicanism, Liturgy, and Church History, the Church of Ireland Theological Institute. This ‘Teaching Eucharist’ was celebrated in the institute chapel on Sunday 8 February 2015 as part of the module Spirituality on the Pastoral Formation course. The words in red italics were read by a student-narrator. The New Revised Standard Version (Anglicized Edition), © 1989, 1995 by the Division of Christian Education of the National Council of the Churches of Christ in the United States of America. All rights reserved. Hymn 693, words © Christopher Idle/Jubilate Hymns.